It's not even spring yet, and I'm anticipating summer. The weather hasn't been too great as of late, and I'm missing Mr.Sunshine. It's about time he paid us a long visit. Oh wells, what can I expect? It's Vancouver we're talking about. 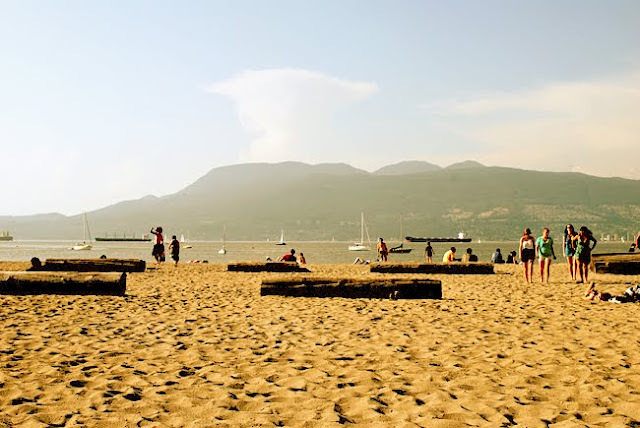 Beach days, BBQs, biking around the seawall, bonfires, and summer sales.. I sure miss it. I unfortunately won't be able to hit up the motherland this summer, as classes are still in session for me, as well as the annual summer camp that I will be chairing this year. What are some of your favorite summer activities? For myself, it varies as to where I'm at. If I'm in Singapore, definitely wakeboarding and taking the yacht out with a bunch of friends for a little picnic on the waters. It's extremely hot over there, so it's nice to be surrounded by the waters to cool down a little. But when I'm back in Vancouver, I love to kits-beach it up! English Bay works too. Shopping on Robson Street, backyard movie nights, bonfires, blading around the seawall.. just to name a few. Pretty stoked for this summer, although it might possibly be my last one in Vancouver for awhile..
ahhh, i love summers here in vancouver! everything is just perfect! its not too hot, theres always a breeze... stanley park, robson street, love it all! (as long as i dont have to actually drive down there, that is. haha) ahhhh! come on summer!!! oh i ABSOLUTELY cannot wait!! I've been awaiting Summer since Winter began .. I hate the cold weather! Vancouver has always been a place I wanted to visit - it just seems so peaceful. You make it sound so tempting!! Oh, and taking a yacht out with a bunch of friends for a picnic on the waters - that sounds extremely funn. Wish I could do that ..
Yessssssss winter needs to go away! Although I'm pretty glad that we didn't get an extreme winter this year..
Oh I do love summer. Its far from ready. Ive been hibernating in sweatpants all winter & munching on potato chips...eek! That is true.. but I'm excited for spring as well and all the florals :) and yeah for sure, it'd be fun! hopefully we get to organize something sometime! boarding for vday? thats awesome! where though? since they're already having trouble providing snow for the olympics! haha!